There are several applications and strategies that teachers can apply TO the designing of lessons and units. There are three tools that support the teaching process that will be highlighted here. One such tool is Planboard, created in Ontario but now used around the globe. Because the lesson planning templates are not necessarily universal, there may be lesson plans that are created and shared by other that will support your future work as a teacher. Thumbprint is a recent contribution to the planning process - it's a place where lesson content, topics and links can be created, shared, and modified. Student results can be tracked. Edmettle is a collaborative tool created by an Ontario educator to provide and manage student feedback for learning skills and work habits. Watch the introductory video HERE. Additional grade book and tracking tools include Edusight (relatively new, located in Waterloo), iDoceo, Freshgrade (a Canadian product) and Seesaw (a digital portfolio tool). Each of these tools provides a focus for assessment, tracking, sharing and evaluating student learning. A teacher's guided tour of the classroom for her new students. She describes the 'learning landscape' that the students are about to enter. Finding interesting ways to apply technology to engage, communicate, and connect to students, parents and other educators. The combinations and adaptations are limitless. The challenge is focusing on the student learning outcomes, student learning profiles, technology tools available in the classroom, and teaching steps to get from one point in the learning journey to a goal or target. Finding the right tools and applications can be a simple or challenging process, depending on these determining factors. Exploring options within networked communities is essential in order to find the best fit for the learning task. Below, there are some examples modelling how technology is designed to support the pedagogy and learning events. Student Storywriting Self-Assessment from Connect Charter School on Vimeo. Using iMovie to demonstrate scientific thinking from Connect Charter School on Vimeo. equity - how will all students engage with the technology in a fair and equal manner? access - where and when will students be able to use the available technology, how will access issues be addressed? affordability - what about the total cost of ownership for any new or older technologies - it's not just the hardware and software that will impact student use. Time, energy and sustainability are ongoing issues for technology integration. management of process and products - includes the logistics of how, where, when and who will access specific tools, resources and materials within a lesson, unit or activity. The focus is on management of the people, equipment, issues and processes being used when technology becomes part of the learning events. 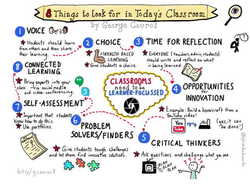 In his blog post 8 Things to Look for in Today's Classroom, George Couros outlines elements that need to be considered when designing classroom teaching and learning with technology. 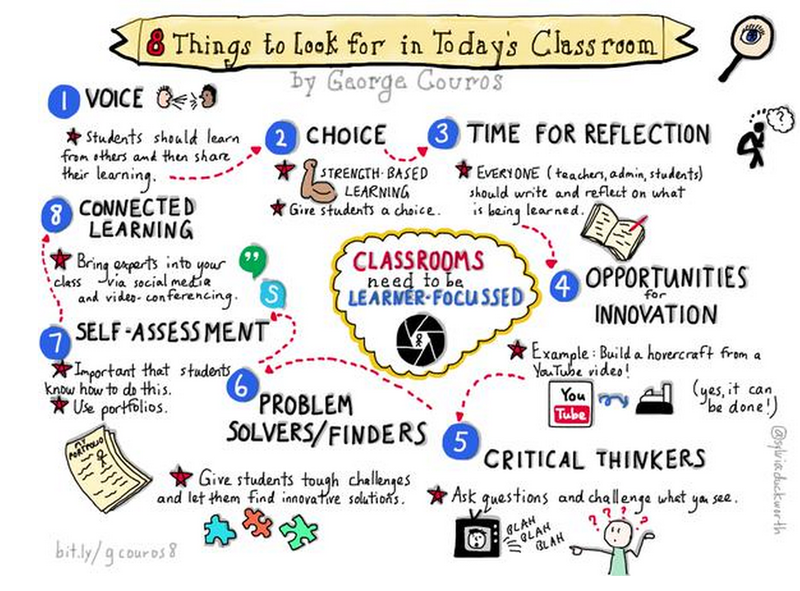 Voice, choice, reflection, innovation, critical thinking, problem solving, self-assessment, and connecting are all part of the learning landscape.